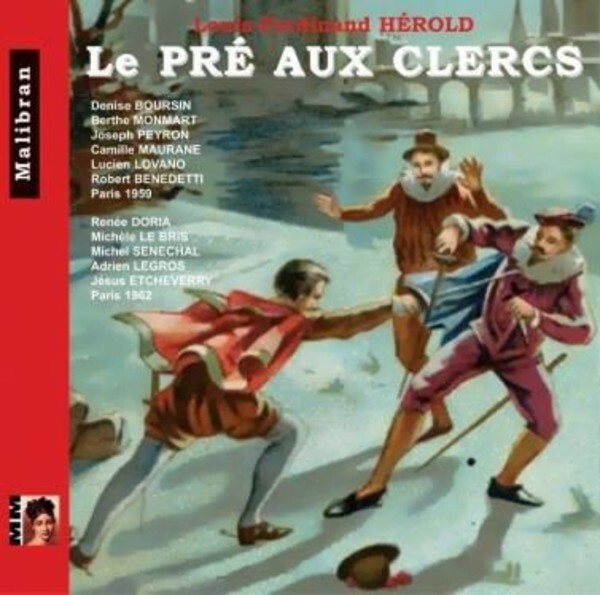 This is the first recording of this rare opera by Louis-Ferdinand Hérold, which has recently been revived at the Palais Garnier in Paris - Le Pré Aux Clercs. It is a comic opera in three acts with words by Planard, written during the reign of Charles IX de Mérimée. Louis-Ferdinand Hérold was born in 1791 and died in 1833. His father, a composer and pupil of CPE Bach and piano teacher, did everything he could to prevent him launching into a musical career, but after the death of his father, the young Louis-Ferdinand enrolled at the Paris Conservatoire. His first opera, 'La gioventu di Enrico Quinto', was first performed in Naples and on his return to Paris, he completed Boieldieu’s opera 'Charles de France'. There followed a number of successful works, culminating in the triumph of 'Zampa' which placed Hérold in the first rank of French composers. The last work published in his lifetime was Le Pré aux Clercs. This double disc presents a complete performance from Paris 13/06/59, with Berthe Monsart, Denise Boursin and Claudine Collart conducted by Robert Benedetti, coupled with extracts taken from a performance from 1962 conducted by Jesus Etcheverry.